a.) Seven (7) properties were recorded sold in ArrowCreek between 21 April and 11 May 2016 (According to the Washoe County Assessor). This brings the total number of properties transferred this calendar year to 27 and over the past twelve months to 78 or 7.2%. A low turn-over rate, still in the single digits that may reflect a general softening of the real estate market. b.) Two (2) of the properties were on the golf course (the property boundaries actually touch the golf course, not just have a ‘view’ of it). Both were homes that sold for 29% more than the rolling 12 month average of $907,644. So, the true selling price, again measured over the past twelve months, increased significantly to $237.09 229.00 per square foot. An increase of $8.09 per square foot, a 3.5% increase from April’s value. No additional lots on the course were sold. The average selling price now stands at $256,577.85 per acre for the 12 month rolling average. c.) Five (5) properties were sold that are not connected to the golf course since the April report. Two homes sold above the rolling average, while the other two sold significantly below the average. Thus, the average selling price of $226.69 228.66 per square foot reflected a continuing downward trend of $1.97 per square foot or 0.9%. The sales price 12 month rolling average was $800,179. One undeveloped lot was transferred during this time period. The rolling 12 month average selling price stands at $193,329.43 per acre. d.) Homes that do not have a boundary with the golf course have moved to a market rate that remains above that for Demonte Ranch and D’Andrea. So the sudden rise of values on the golf course could be an aberration or it could well portend a rise for custom homes in general. Values continue to follow the market trends where upper end home values are trending downward and stay on the market for an extended period of time (this is true in both the Washoe and Douglas county markets). e.) There was one lot sold but a premium remains if the lot has a common boundary with the golf course. This value between the two categories, in general, appears to be following market trends. However, there’s little explanation for the $63,248 per acre difference between the vacant lot purchase prices, as the difference does not show up in the closing home sales prices. However, it is worth noting that there are a very limited number of ‘golf course’ lots versus those not on the golf course. f.) The trends for our property values indicate that over the past twelve months of tracking, the values of homes off the golf course were fairly stable, with the gap between homes on and off the course showing a decreased margin. It should be noted that with this latest data set, homes not on the golf course have declined below the value of a year ago. Homes on the golf course continue to be above the year ago values. 2. 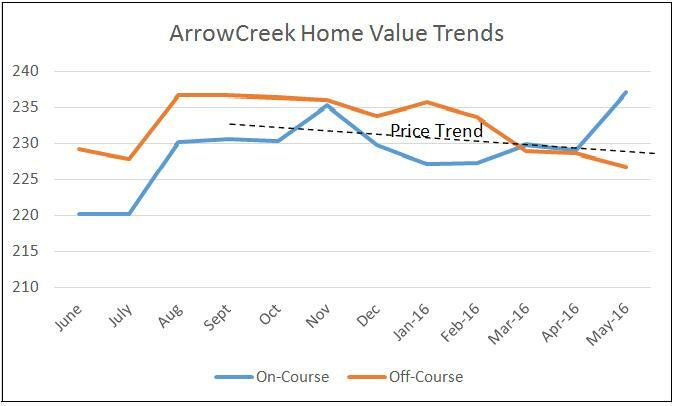 From the chart it’s pretty clear that home values for homes not on the golf course in ArrowCreek have been declining since last August. Homes on the course were also in decline for the same period; however, the May data indicates a change in trend. The housing market in Northern Nevada for existing homes continues to follow the economic trends. As the spring selling season is upon us, perhaps we’ll see a boost to our unique community. Going forward let’s focus our energy on improving the amenities we currently have and build out those that were in the original ArrowCreek/Southwest Point development plan, by using our already available acreage and funding. With that we should see a better environment for all home owners and buyers. If you wish to support The Club at ArrowCreek, you are urged to become a either a full golf or social member. In addition, the FOA LLC is certainly open to new investors. …which updates the June 4, 2015 posting You Want Facts: Here Are Facts. June 2015 Study on Golf Course Closure Impacts On Home Values in Northgate and D’Andrea.